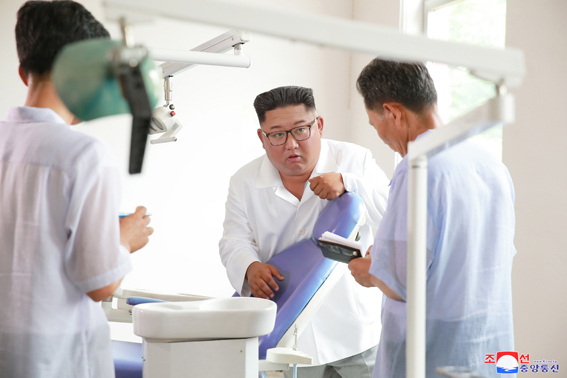 Kim Jong Un, Chairman of the Workers' Party of Korea, Chairman of the State Affairs Commission of the DPRK and Supreme Commander of the Korean People's Army, inspected the Myohyangsan Medical Appliances Factory. Looking round the room for education in the revolutionary history, sci-tech learning space and various workshops of the factory, he learned in detail about production of medical appliances. Recalling that the Party had already given policies several times to remodel and modernize the units associated with leadership exploits of the great leaders, including the Myohyangsan Medical Appliances Factory, and turn them into model ones since the end of the Seventh Congress of the Party by taking issue with the serious situation that the public health sector almost failed to do the work for consolidating its material and technical foundation in recent years, he said he cannot but be very concerned about and disappointed by the bad situation of the factory. He noted that he could not understand whether the factory was under remodeling and modernization or not and what had been remodeled and modernized as he could not see any sign of remodeling though it has been two years since the Party gave a warning to it. Other sectors have made remarkable leaps forward in recent years, but the public health sector has never done so but become more and more passive, he said, noting that there is nothing to be proud of in the public health sector, except the modern hospitals, the Medical Oxygen Factory and the Dental Hygiene Products Factory recently built under the direct control of the Party. There is no unit keeping its environment well in the public health sector, to say nothing of equipment modernization, he charged. The Party has stressed the need to intensify its guidance over the public health work and called for the Cabinet and the people's power organs at all levels to fully discharge their responsibility and role in the work for consolidating the material and technical foundation of the public health sector as the public health policy in the country is premised on the State investment and supply of materials, but officials are very idle and irresponsible in doing so, he pointed out. He earnestly called for successfully turning the Myohyangsan Medical Appliances Factory, which President Kim Il Sung founded and paid deep attention to till the last moments of his life, into a model one playing the leading role in the industry of medical appliances to realize his wishes and glorify his leadership exploits down through generations. It is necessary to stand in the van by destroying and transforming the outdated ones, not loosing the heart, he said, adding that they should not repair some old buildings only but arrange the production environment as required by the international standard, and modernize production processes on the basis of the latest science and technology and turn the factory into an ultra-modern one capable of producing highly efficient quality medical equipment and appliances meeting the international standard. He called for newly building the Kimilsungism-Kimjongilism Study Hall and the room for education in the revolutionary history, and sci-tech learning space, products exhibition room and cultural and welfare facilities fashionably, and production buildings with scientific calculation, underlining the need to study measures for radically improving the levels of domestic production, automation and modernization of medical appliances factories. He stressed the need to turn medical appliances factories of the country into modern ones producing excellent medical facilities on the basis of advanced science and technology by making practical annual and stage plans of three to four years and dynamically pushing forward the work through strict reviews on the execution of the plans for the prospective development of the industry of medical appliances. Underscoring the need for the officials and employees of the factory to turn out as one in the drive for updating with consciousness of being the master, he said he would send the first Chollima of the public health sector to the factory, and encouraged them to take the lead in the public health sector and the industry of medical appliances of the country by riding on the Chollima. He was accompanied by Hwang Pyong So, first deputy department director of the WPK Central Committee; Jo Yong Won, Kim Yong Hwan, Pak Song Chol, O Il Jong and Kim Yong Su, deputy department directors of the WPK Central Committee; Kim Chang Son, department director of the State Affairs Commission; and Ma Won Chun, bureau director of the SAC.